A new wine brand launched a couple of months ago, with a bit of a splash in the trade press and samples landing on the desks of wine journalists around the UK. 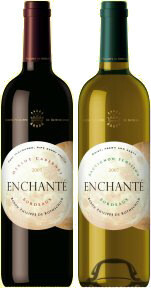 The new brand is called Enchanté, and is a joint-venture between the giant Constellation Brands of the USA, and Philippe de Rothschild, owners of Château Mouton-Rothschild and their own Bordeaux brand, the popular Mouton-Cadet. According to Constellation brands the new wines are “a ground-breaking range of Bordeaux wines specially blended to suit the palate of today’s UK wine drinker, with a label that consumers can understand.” The launch is backed up by what Constellation claim to be the “biggest marketing communication in the UK’s French wine category (£1m in 2008).” Part of that strategy was a live webcast, in which invited journalists could watch Constellation’s Consultant Master of Wine, Philip Goodband, and Baron Philippe de Rothschild’s Head Wine Maker for Branded Wines, Guy-Henri Azam, be interviewed about the wines. It was much more PR puff than anything more meaningful, but tellingly, when the tame interviewer mentioned the wine’s pricing, Goodband almost immediately jumped in to say that they would be regularly ‘on promotion’ at much less than their RRP. It is one of the depressing facts of big brand wines sold through supermarkets and multiples in the UK today, that discounts, promotions and deals are what sells wine. It is increasingly hard to find honest pricing, where a £6.00 wine is actually worth £6.00. It might taste more like a £4.00 wine – which coincidentally is the price you can buy it for ‘on promotion’. My notes on the new wines follow, and to compare, I also tasted both Baron Philippe’s Mouton-Cadet and the ‘Premius’ brand from Bordeaux négociant Yvon Mau, all of which have similar headline prices and represent the populist face of Bordeaux in UK high street stores. The Enchanté red Bordeaux is a blend of Merlot and the two Cabernets, Franc and Sauvignon, and sees partial oak ageing. It has a moderately spicy, but fresh and fruity aroma, with a touch of kirsch-like cherry brightness over more solid, plummy fruit. On the palate it is fairly dry and perhaps lacks a bit of flesh, and although savoury and food friendly, I just find something a tiny bit lean and ungenerous on the finish. £7.20, Thresher, Sainsbury’s. 84/100. A wine that uses the white Bordeaux trinity of Sauvignon Blanc, Semillon and Muscadelle, this a ripe passionfruit and peachy character, with a little hint of toast in the background. On the palate this is full and quite opulent, with plenty of peach and ripe, juicy pear fruit. It is balanced, with good acidity and a clean, crisp and juicy finish. £6.99, Morrisons, £7.19, Sainsbury’s. 86/100. Bottled under natural cork unlike the synthetic cork of the white, this blend of Cabernet Sauvignon, Cabernet Franc and Merlot has a juicy cherry and red plum nose, with a touch of leather and wet leaves. On the palate I find this slightly raw, with a dry, quite lean palate showing some black fruit with low levels of liquoricy tannin and acidity meaning it rather dies on the finish. Would be better with food. £6.99, Morrisons, £7.19, Sainsbury’s. 85/100. There’s some sense of leafy, grassy character, but then apple fruit and a certain, but very subtle, vanillin note too. The palate has clean, crisp white fruit and a rather lean core where lemony acidity becomes the driving force. This has a bit of weight and presence, and decent length, thought it is fairly one-dimensional in its lemony tang. £7.99, 85/100. A blend of Cabernet Sauvignon and Merlot grapes goes into this Bordeaux pink, which has a vivid colour and nicely restrained nose showing some earthy, leafy quality and high-toned cherry and raspberry fruit. On the palate there is a hint of fruity sweetness, but this is basically a dry wine, with a big tugging core of slightly harsh lemony acidity, that gives the finish a slightly strident edge. £6.99. 84/100. Premius rouge is a blend of Merlot, Cabernet Sauvignon and Cabernet Franc that has spent some time in oak. It has quite a deep, rich colour and a solidly fruity nose, with lots of red plum and blackcurrant and a little liquoricy spice note. On the palate this is quite full, with a little grilled meat succulence to moderate berry fruit. The tannins add a little grip, and this finished with some concentration and pushes through with a bit of savoury power. £7.99, EH Booth. 87/100.